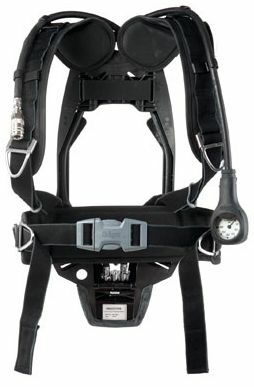 The Drager PSS® 4000 one of the lightest professional self-contained breathing apparatus for firefighters. Combining comfort with exceptional pneumatic performance, this SCBA is designed for applications where simplicity and ease of use are crucial. Lightweight yet robust, and easy to don, the PSS® 4000 provides outstanding breathing protection. The Drager PSS 4000 is one of the lightest professional self-contained breathing apparatus on the market and contains the same advanced technology and design philosophy as seen in our leading range of standard and extended duration professional breathing apparatus. Supported by a carrying harness with a quick release fastener and simple pull forward mechanism you can quickly and easily adjust the carrying harness. The extremely durable carrying system features our ultra-lightweight, high strength composite carrying space frame, which provides outstanding thermal, impact and chemical resistance properties. The professional carrying system of the harness follows the natural contours of the body, improving stability and reducing back strain, stress and fatigue. The system offers optimal comfort for the wearer's shoulders and waist with an even load distribution, which is comfortably and securely in line with the body's centre of gravity. Aside from maximum comfort, the Drager PSS 4000 also uses the most rugged and durable materials available in order to minimize the impact of even the most hostile of environments. The Drager PSS 4000 utilizes state-of-the-art harness materials, which have been designed to withstand the high wear and tear fire fighters face every day, while providing an enhanced level of comfort. By incorporating hardwearing stainless steel buckles and long-life blend webbing made from aramid fibre, it is ideally suited for extended wear and frequent use. Aside from being quick and easy to service, the Drager PSS 4000 comes with various, innovative design features that help reduce downtime and unnecessary maintenance costs. This can be seen in all major components, which are simple and quick to remove and re-assemble. The harness is attached to the carrying frame by an innovative single-piece retention method. For added convenience, the first stage pressure reducer is integrated into the carrying frame. The closed, single piece harness and waist pad design prevents excessive water absorption, which reduces cleaning and drying time, whilst optimising energy efficiencies. The medium pressure air supply and gauge hoses are completely integrated into the carrying-frame in order to reduce the risk of snagging and potential entanglement. This substantially improves security and safety while entering and working in confined spaces. An additional benefit is the ability to re-route the hoses from one side to the other in order to suit customer preferences for gauge access. This design feature also facilitates the easy replacement of each hose. Enhance your safety in the field with the Drager Bodyguard 1500, an advanced personal alert safety system (PASS). This breathing protection control and non-motion-detector generates visual and acoustic alert signals if you are in distress. Furthermore the system provides a wireless data transmission between the PASS and the monitoring devices. The backlit Tx Gauge wirelessly transmits its pressure data to the Bodyguard 1500 and also to the Drager FPS 7000 Head-Up-Display (HUD) if being used. This feature provides automatic visual notification from the Tx Gauge and acoustic notification from the PASS when the air supply drops below user-defined limits.